It is complementary to functions already included in After Effects for this task by providing additional shapes and settings. 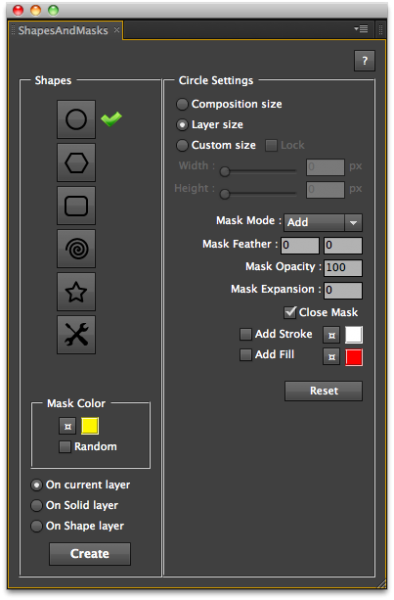 The options to set the mask parameters are also included in the script. Besides the creation of shapes, it includes some useful tools for masks transformations. The creation and transformation of masks can be applied either on the current layer or on a new layer, solid or shape layer. Modify rotation and scale, with the possibility to apply it on the current mask path or on a duplication. Horizontal axis symmetry, flips the mask symmetrically at its center on the horizontal axis. Vertical axis symmetry, flips the mask symmetrically at its center on the vertical axis. Reverse mask path, reversing the direction of the mask path without changing the values of the vertices and tangents. Curve to vertices, allow you to convert "subdivide" a curve into vertices with chosen spacing. Display mask data and save them in a .txt file. Note - The creation of shapes and masks does not apply to these types of layers: Null object, Light, Camera. Mask parameter settings (Mode, Feather, Opacity, Expansion) does not apply to shape layers. Note - It can be used as a dockable panel by placing the script in a ScriptUI Panels subfolder of the Scripts folder, and then choosing it from the Window menu. Note - To be able to display a user interface with icons and save the text file from the ‘Get mask data’ function of the ‘Tools’ section, you need to check for the "Allow scripts to write files" preference. In ‘Preferences’ > ‘General’ > enable ‘Allow Scripts to Write Files and Access Network’. Runs on Mac and PC in the same way, tested on CS5, CS5.5 and CS6. This script is provided "as is" without warranty of any kind, expressed or implied. In no event shall the author be held liable for any damages arising in any way from the use of this script. Bezier Node simplifies the process of animating bezier curves and other lines, from completely straight to 1000% curvy. KeyMix allows you to mix multiple keys on a single layer using masks or a matte layer. Free and un-watermarked for renders under 720p! Shape Layer Toolbar gives you quick-access buttons for shape layer elements and expression controls. Set your values. Create a matrix of images contained in a folder for the plug-in Viz Artist "Temo".